Intel has not made a big fuss about it, but the chip maker has kicked out a promised 15 watt processor aimed at the fledgling and sometimes cloudy microserver market. 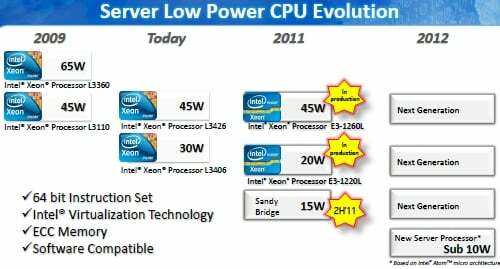 The chip, which is paradoxically called the Pentium 350, was promised back in March when Intel pre-launched the "Sandy Bridge-DT" Xeon E3-1200 series of chips for single-socket servers. And despite its name, an Intel spokesperson confirmed to El Reg that just as the roadmap back in March said, the Pentium 350 is indeed a true Sandy Bridge part based on the same cores used in the Xeon E3s. The Pentium 350 is the Sandy Bridge-DT part missing from the 2011 microserver chip lineup, and joins the Xeon E3-1260L, a low-voltage chip with four cores running at 2.4GHz with a 45 watt power draw, and the Xeon E3-1220L, which has two cores running at 2.2GHz clock speed and only sips 20 watts. Both of these chips have Intel's Turbo Boost clock-speed bumper as well as HyperThreading, VT-x CPU and memory virtualization electronics and VT-d I/O virtualization circuits, AES instructions, Trusted Execution Technology (TXT), and a slew of other features that are standard in Sandy Bridge parts. The dual-core Pentium 350 runs at a mere 1.2GHz and has HyperThreading and VT-x support, but does not do Turbo Boost, VT-d, AES, or TXT. Like its older and more powerful low-voltage Xeon E3 brothers, the Pentium 350 fits into the "Socket H2" LGA1155 socket and supports up to four memory sticks for its single socket, maxing out at 32GB of DDR3 memory running at 1.07GHz or 1.33GHz. All three chips are also etched using Intel's 32-nanometer processes. If processors for microservers are a niche at Intel that might someday account for as much as 10 per cent of CPU shipments, then the Pentium 350 represent are a microniche. Intel has said that for the bulk of microserver customers, the Xeon E3 chips will be the best solution in terms of performance and bang for the buck, and that the Pentium 350 and future server-class Atom processors – due next year with ECC memory scrubbing – will be suitable for very few customers.